Abstract: This 400Watt unit comes armed with a bristling array of cables as well as a rear mounted knob which controls the speed of the LED-lighted 120mm fan. Good power supplies have a few common attributes. They are stable (meaning that the voltages they provide to your computer do not fluctuate much), efficient (wasting little energy in order to supply power to your computer), quiet and easy to install and configure. These are the principle values we look for when reviewing any new power supply. Additional features and frills such as pretty lights, UV reflective coating, fan controllers, etc. are nice, but beside the point. With this in mind, let's take a look at the latest PSU to cross our bench, the AOpen Silent Power AO400-12AHN. This 400Watt unit comes armed with a bristling array of cables as well as a rear mounted knob which controls the speed of the LED-lighted 120mm fan mounted on the bottom of the PSU. The fan controller is an interesting idea, letting users find their own ideal balance between noise and cooling for their case. we'll see how it works in practice. 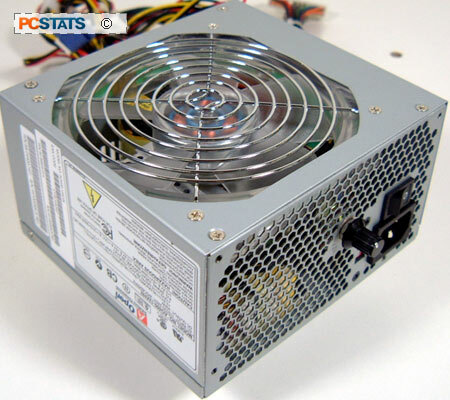 According to Aopen, the PSU can override the fan setting if it exceeds a certain temperature, which seems sensible. Users Manual, Power Cord, 24-to-20 pin ATX connector. Like most modern power supplies, the Silent Power AO400-12AHN supports serial ATA power. Our review model came with two SATA power cables attached. It uses a newer 24-pin main ATX power connector to supply power to the motherboard, but AOpen includes an adaptor to change this to the older 20-pin ATX standard. Its worth noting that this adaptor is one of the most unfriendly and sharp pieces of plastic I have yet encountered! According to the manufacturer, the +3.3V line can deliver up to 30 amps while the 5V rail can supply up to 28 amps. The 12V line is split into two to power the secondary 12V connector, and the two lines can pump out 14 amps and 15 amps respectively. Maximum peak power output of the AOpen Silent Power AO400-12AHN is 400W. The power supply features over-voltage protection, which apparently shuts itself down to avoid damage in the case of a power surge.